With the world’s growing energy needs, it’s becoming increasingly clear that the energy industry will continue to diversify and expand. 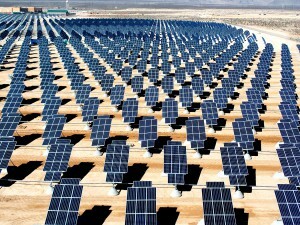 As a result, there is now greater interest in renewable energy sources, with solar energy being among the most popular. According to the Solar Energy Industries Association, solar accounted for about 40 percent of all new energy producing capacity to come online during the first half of 2015. The growth in solar energy production has occurred both on a small-scale residential basis and a large-scale utilities basis, with a new solar energy project being installed every two minutes. With so much interest in solar energy as one method of fulfilling our future energy needs, it’s no surprise that there is also growing interest in how to turn out efficient solar energy projects. As with many development projects, land surveying is one of the first and most crucial components. The solar energy industry has some unique challenges when it comes to land surveying. Working with a land surveying firm that has direct experience working on renewable energy projects is the best way to address these challenges, but for now, read this post to get a brief introduction to the subject. Like any large development project, utility-scale solar energy development projects require detailed and accurate land surveys that can be turned around quickly. The unique challenge that solar energy projects face is that they often cover very large areas, making it challenging to complete the surveys quickly. Traditional land-based surveyors will have difficulty covering such large areas in a timely manner, and when they have finished their work, they still have to return to an office to compile their results before the engineering staff can begin drawing insights from them. Taken together, these factors account for a very slow information gathering process, which greatly increases the expected time to value for a large-scale solar project. In addition, while accuracy is always important for land surveys, the bar is set especially high for renewable energy projects such as solar. In order to maximize their effectiveness, solar energy collectors must be properly located; this in turn requires the availability of very accurate land surveys. Even a small inconsistency could result in a solar installation that is not as effective as planned. Once again, traditional land surveying methods may not be good enough to get the job done. To meet the unique challenges of new energy production technologies, it is necessary to work with new land surveying technologies. For example, unmanned aerial vehicles (also known as drones) can complete land surveying work in a way that is highly superior to traditional land surveying methods, making it a perfect choice for solar energy projects. Check out some of the standard imagery and data sets we provide, directly from your browser. You don’t need any special software and the data is hosted as a service instead of having to download hundreds of gigabytes of data. Landpoint’s UAVs can be set to follow predefined routes, allowing them to cover large areas of terrain in a relatively short period of time. In addition, UAVs are able to relay their findings back to engineers in the office, essentially removing the waiting period involved with gaining insights from land surveying projects. This fact makes UAVs especially well-suited to support solar energy projects, which can often span very large areas. In addition, UAVs are capable of creating very accurate land surveys, which is another must for solar energy projects. Equipped with today’s high-definition cameras, UAVs can capture land surveying images with resolution as high as 1 centimeter per pixel. UAVs are also able to fly over difficult terrain and get themselves into and out of tight spots easily, a factor that allows them to get a much closer look than traditional land surveying methods could. For all these reasons, UAVs are capable of getting the very accurate surveys that solar energy projects require. To learn more about land surveying technologies for solar energy projects, contact Landpoint today.